These days it seems like we always are in need of something. Today I made my pilgrimage to the local store. As I motored around in search for dinner items, I began to grumble about just how big the store was and that I couldn’t find my way without a map! It wasn’t long before this Scripture came to mind, surely sent by the Lord Himself bringing to remembrance just how blessed I am. I really have no wants. The Lord provides everything I need for today. As I begin writing this piece, I began to focus on the difference between a ‘want’ and a ‘need’. There are a lot of things I ‘want’, that if I were to recall them all just in one year, I’d surely be embarrassed to share them with you. The fact is that ‘many’ of the things I ‘wanted’ a year ago simply don’t fit in to the life I’m living right now. For example, a year ago, Patty and I were planning our wedding. It didn’t cross my mind until a few months later that all the ‘wants’ before I got married just didn’t fit in now. As we walk with the Lord, we begin to see that walking with a ‘light pack’ is essential if we’re going to be able to navigate the path He leads us through. We can’t burden ourselves with all the ‘wants’ of the past that we have accumulated over the years. No better to illustrate this fact than to look at all the storage places available to store our ‘wants’. And to add to it, we ‘pay’ someone to store all the ‘wants’ we bought that, chances are we will not see again for years! Let’s think about this part of a well known passage of Scripture. The way I see it, the meaning of this can be reduced to a simple question. If the Lord is my Shepherd, He already ‘knows’ what I will need in my journey with Him ‘Today’, so why not just ask Him and watch how He will ‘provide’ exactly what you will need for the day? If I am truly allowing my Shepherd to lead me, than I must become completely depending upon Him. Depending upon His Wisdom, Depending upon His discernment, Relying upon His knowledge of me, and insistent upon just being satisfied with His love for me? Walking daily, having Him near me, dependent and relying upon Him for all my needs, after all, how many have we ‘planned’ our days and have come up discouraged, disappointed, and forlorn when it was all said and done? 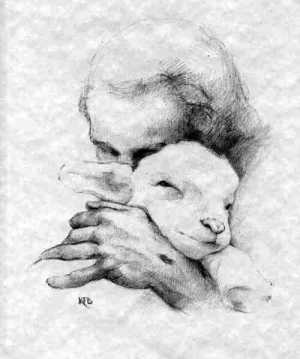 Jesus Christ IS that Good Shepherd, God the Father has given Him to us to provide us personally with all we need. No troubles, no headaches. Just a sweet walk of faith, knowing that our Shepherd will never let us down, because we belong to Him! you’re welcome! How are you doing?